Blood tests should be performed before and after each meal, requiring over 8 per day. At $0.19 each, this is a cost-effective way to perform the required tests. No issues, and appears to require less blood than OneTouch®. Just tested them against my regular. Great A++++++++++++. Strips work great. Will be back. Great price. Thank you A+++++ Great seller. Highly Recommend! These strips really work for OneTouch® machines! Great product at a fraction of the name brand. I'll be back for more. Strips are fantastic. Will be ordering more in the future. Great price. Great product, Great price, super fast ship... what's not to like? AAA++++. Works great. I'll be buying my test strips here from now on. Works as well as One Touch® Ultra® branded but seriously cheaper. I have just started using and exceeds my expectations." "The Strips Did the job as perfectly as the originals. The generic Unistrips work as perfectly as the originals and the results are quite close. I even compared both strips with the same blood sample, and the difference with the results was only 3 mg/dl." 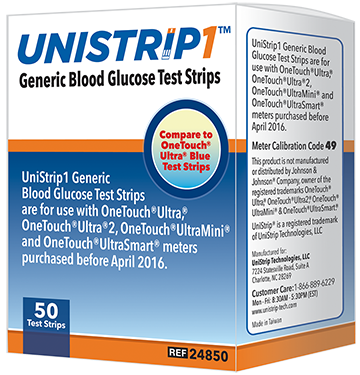 "Same results as higher cost test strips at 1/3 the price. I was a bit skeptical when I purchased as the price was so much lower than the name brand option. I've used these for the last 5 days and have also kept using the name brand at the same time to double check. Results have been the same for both. Seems like a no brainer based on results and cost." "I am so glad I tried them. I highly recommend them. They are perfect with my OneTouch® Ultra® mini meter. I have not had a single failed strip from an entire box of 50 unistrip. They are better than the OneTouch® strips. With the OneTouch® strips, I had about 10 to 15 errors out of every 100 strips. Considering the cost of the strips and the fact that I have to test my blood sugar at least three times a day, that is a lot of wasted money."